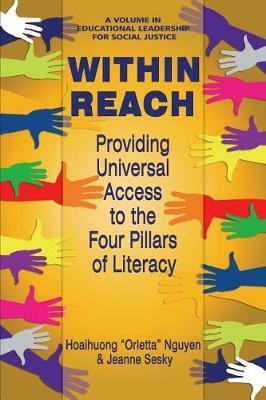 Within Reach is a text for anyone interested in improving instructional practices with their students, and in expanding those practices from classroom to classroom. The multifaceted sections of the text broaden the audiences: teacher leaders, administrators, practicing teachers, and teacher/administrator preparation programs in higher education. The content from Within Reach can be used to build systems and practices to increase instructional effectiveness to address diverse students' learning needs. The text offers research?based, effective, instructional practices and how they relate to diverse learners and Common Core, as well as to understand how to employ teacher leaders to network such practices. Within Reach is an excellent match for district and federal funding because it focuses on professional development to bridge the achievement gap, instructional accountability measures, and making connections to the Common Core. Districts can access funding through Title 1, Common Core funding initiatives, and federal grants. It can also be adopted in higher education teacher and administrator preparation programs. For example, in teacher preparation programs, Within Reach covers topics such as Teaching Multiculturalism Education, Teaching Students with Mild to Moderate Disabilities, Teaching English Language Learners, and Language Acquisition and Development Certification Courses, and Teacher Leadership.